Please click on an image for further details and to order. Insulated durable vinyl delivery bags, Available in Pizza delivery sizes and open topped versions suitable for delivering food in rigid trays or boxes. 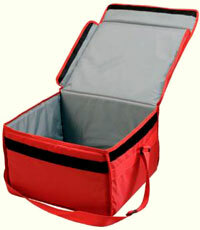 We reccommend that the open topped bags are used with the semi-rigid removable liners. Our pizza delivery bags (above) have been engineered with space-age materials in order to provide outstanding thermal insulation whilst enabling the contents to “Breathe” off excessive moisture. This helps ensure that the contents are delivered warm and dry, overcoming the problems encountered with inferior copies. 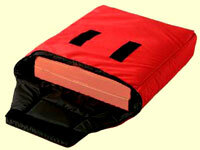 The bags are machine washable at high temperature. 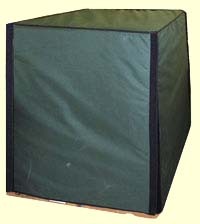 Industrial thermally insulated palletised produce covers.